What goes better with St. Patrick’s Day than gluten-free beer? There are so many varieties available today, you can afford to be choosy. But did you know that you can make bread with it? This is a quick bread, so even though it’s yeast- free, it rises beautifully and even makes a great sandwich bread. You can try a thick slice slathered with butter, or on its own with a nice cold bottle of beer. 1. Preheat your oven to 375° F. Grease a loaf pan no larger than 9 inches by 5 inches with unsalted butter. Set it aside. 2. In the bowl of a stand mixer fitted with the paddle attachment, place the flour, xanthan gum, cream of tartar, salt, whey powder, baking powder and baking soda. Mix on low speed until well combined. 3. Add the cider vinegar, egg whites and butter, blending well after each addition until well combined. 4. With the mixer on low speed, add the beer to the mixture in a slow, steady stream. Once the dough has started to come together, turn the mixer up to about half speed and beat for one minute. The dough should be thick and shaggy, not smooth. If it seems too wet, add more flour by the tablespoon and mix well until you reach the proper consistency. 5. Scrape the dough into the prepared loaf pan. With very wet fingertips, smooth the top of the bread, and make sure that it is evenly distributed throughout the pan. 6. Tent the loaf pan with aluminum foil, and place in the center of the preheated oven. Bake for 25 minutes. Remove the pan from the oven, rotate it one half turn, and remove the foil tent. 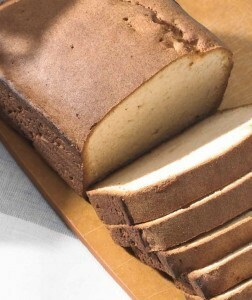 With a very sharp knife, make a shallow slice down the center of the loaf, along the length of it. Lower the oven temperature to 350° F. Continue baking for another 15 to 20 minutes, or until the bread is deep brown in color and beginning to pull away from the sides of the pan. 7. Turn the bread out onto a rimmed baking sheet lined with parchment paper, and return to the oven. Bake for another 8 to 10 minutes, or until a toothpick inserted in the center of the bread comes out clean and the loaf sounds hollow when thumped on the side with your hand. 8. Remove from the oven and cool for 10 minutes on the pan. Transfer to a wire rack to cool completely. Slice only after it is completely cooled. *From the book Gluten-Free on a Shoestring, by Nicole Hunn. Reprinted by arrangement with Da Capo Lifelong, a member of the Perseus Books Group. Copyright © 2011.